Visitor arrivals to Grenada increased by 12.7% in 2015, reaching a total of 443,368 when compared to 2014 (393,339). Cruise passengers represented 63% of arrivals, followed by stayover visitors (32%), and yachters (5%). Visits were mainly for leisure, business, and study. Cruise and stayover arrivals contributed an estimated $362 million Eastern Caribbean dollars to the economy in 2015. “We have seen positive growth in Grenada’s tourism sector last year. 50,000 more visitors in 2015 than in 2014 is a testament to the dedication of our stakeholders and the commitment of our trade partners. 76 rooms have been added to the GTA’s registered room stock last year, and new flights added to our schedule,” commented Mr Rudy Grant, CEO of the Grenada Tourism Authority (GTA). The number of stayover visitors in Grenada in 2015 increased by 5.4%, amounting to 140,735. 13% more persons visited in December 2015 than in December 2014. Visitors mainly arrived from the United States of America, the United Kingdom, the Caribbean, Canada, and Germany. The USA provided the main source of stayover arrivals in 2015, representing 41% of the market. More Americans travelled to Grenada by air in 2015 (57,629) than in 2014 (50,302), a growth of more than 7,000 persons (+14.6%). “The increase of daily flights from Miami, and added weekly flights from New York and Atlanta positively correlated with the growth seen from the USA. These routes and frequencies expanded the potential of connecting flights from other US cities, Canada, and European countries,” said Ms Esther Thomas, Manager of Research & Planning at the GTA. There was a 5.0% growth in stayover visits from the United Kingdom, the second largest source market, followed by a 2.4% increase in Caribbean visitors. Arrivals from Germany grew by 23.5%. In contrast, there was a 13.4% decline in the number of Canadian visitors as a result of “an inconsistency of airlift from Canada,” as stated by Ms Thomas. Caribbean visits spiked in the month of August coinciding with Spicemas, Grenada’s larger carnival, while significant increases in travel were noted for the months of February and November. Growth was seen from the Caribbean’s leading source markets, Trinidad & Tobago (+7.1%) and St Vincent & the Grenadines (+4.1%). The number of visits from Grenadians Residing Abroad (GRA) totalled 18,261 in 2015, an increase of 11.1% when compared to the 16,442 visits in 2014. July, August, and December recorded the highest number of arrivals, as GRA return home with second and third generation Grenadians to experience the Spicemas and Christmas seasons. There was a 19.3% increase in cruise passenger arrivals in 2015 (280,518) when compared to 2014 (235,140). 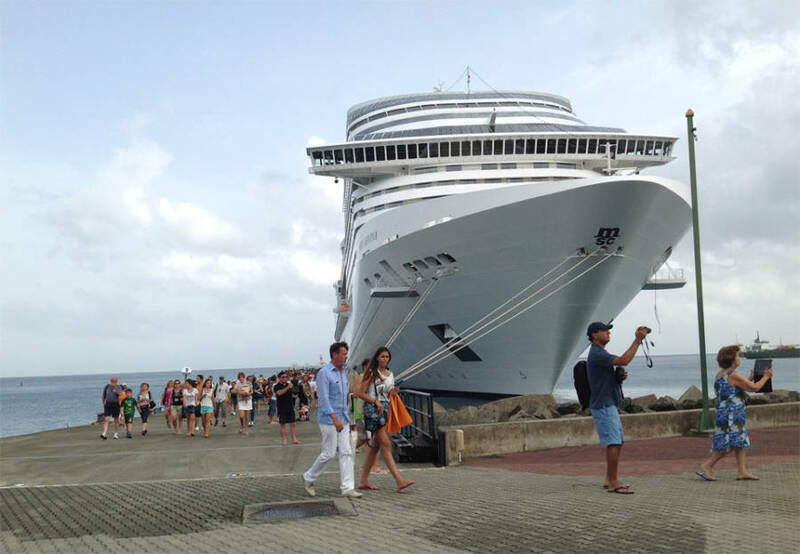 Cruise business negotiations resulted in 41 more cruise calls to Grenada and Carriacou than the 156 calls in 2014 — 8 cruise ships had inaugural calls to the Port of St. George’s last year, including the 3650–passenger Britannia. For the first time in 5 years November (+72.9%) and December (+51.2%) recorded the greatest increases in cruise passenger arrivals when compared to the same months of the previous year. Yacht calls to the tri-island state increased by 5% in 2015 (5,247). Carriacou continued to receive more than 50% of yacht calls to Grenada (2,780). A sum of 22,115 visitors to Grenada arrived by yacht, a 10.3% decline when compared to that of 2014 (24,650). “Though marinas saw less yachters last year, it was observed that they spent more time on island which created a positive economic impact. More boats berthed on our islands, particularly during the months of June to October. Many yachters also visited for international sailing events like the Grenada Sailing Week,” said Mrs Nikoyan Roberts, Nautical Development Manager at the GTA. The Grenada Tourism Authority uses visitor statistics to carefully guide its destination marketing initiatives and advise its stakeholders. It is anticipated that in 2016 there will be further tourism development to include luxury accommodation and more diverse product offerings.